I want to talk to you a little bit about P90X vs P90X3. In this post, not only will I talk about how they are similar and how they are different, but I’ll give you a good overview of the new P90X3 workout and provide answers to the questions we get most often about the program. First, a little P90X trivia—the name is code for Power 90 Extreme. Power 90 was the Beachbody program that got Monica and I started on the health and fitness path over a decade ago. I don’t think I need to explain what “power” stands for, but 90 stands for 90 days, which is the duration of the programs. It’s best to start off this P90X vs P90X3 comparison with a P90X3 overview. P90X3 is the latest of the P90X Workouts. It is not a sequel to P90X or P90X2—it’s a separate program with 16 ultra efficient 30-minute workouts. It is not a harder version—in fact, even beginners can start with P90X3. If you’ve done P90X or P90X2, you’ll see both similar and different moves. Of course, there’s science behind this concept. The program’s “Muscle Acceleration System” makes the most of the 30 minutes as a result of concentrated variety and intensity. One of the best aspects of the program is that you have a choice of three modes—Classic (to get “ripped”), Lean (to tone without bulking up), and Mass (to increase muscle mass). Each 30 minute workout begins with a two minute warm-up, then constant work for 28 minutes. The science behind this suggests the first 30 minutes is the most effective part of any exercise routine, so they accelerated the workouts to create the most effective 30 minute routines. There is a separate warm-up disk called Cold Start if you need a longer warm-up due to environment, time of day, etc. The P90X3 Nutrition Plan goes back to nutrition basics of Power 90. It’s full of very tasty and easy-to-prepare recipes. 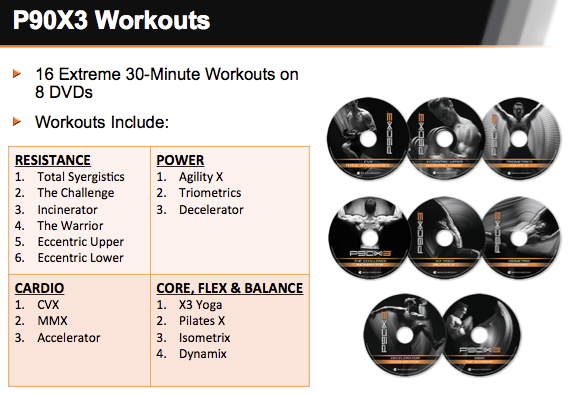 There are 16 workouts in the P90X3 Base Kit; the Deluxe Kit has four extra routines for a total of 20. Most of the ab moves are athletic in nature; some are standing up and many are front facing instead of being on your back. There are four schedules in P90X3—Classic, Lean, Doubles, and Bulk. The only equipment you’ll need are weights or bands (a pull-up bars is great like in P90X, but optional). Every move in P90X3 has a Beginner/Modified, In Between, and Challenging/Hard version. How are P90X and P90X3 Similar? All three P90X programs—P90X, P90X2, and P90X3—give you the guidance of a personal trainer in your own home. They’re used all over the world over by fitness professionals, athletes, celebrities AND regular folks who want to get seriously fit. As I mentioned before, each of these programs is 90 days in duration. Both of these programs are well-rounded, which means that you will do cardio training, strength training, and yoga. You won’t be doing only one thing like with Body Beast, which is all about weight training. This workout diversity is what gives people such great results—they burn fat and build muscle at the same time. Needless to say, don’t get too focused on the scale. If your clothes are feeling baggy and the scale is not moving, that is because you are losing fat and building lean muscle. The intensity or difficulty of each program is equal. They also each come with a meal plan that will help you accomplish your goal in the most beneficial way for your body. How are P90X and P90X3 Different? TIME—One of the most difficult aspects of P90X is time. Your daily commitment is 60 to 90 minutes, which takes a lot of time out of your day and can pose a challenge if you have kids and a full-time job. Time is one of the main reasons why people tend to give up on P90X. All of the P90X3 workouts last only for about half an hour. This is a major time saver without compromising on effectiveness one bit. SCHEDULES—P90X has three different schedules (Classic, Lean, and Doubles) and P90X3 has four (Classic, Lean, Doubles, and Mass). The Lean schedule has more cardio, Classic is really well-rounded, Doubles means that you will train twice a day, and Mass will have you doing more strength training and eating a little bit different to gain muscle mass. NUTRITION PLAN—The P90X Nutrition Plan comes separately from the workout program AND it changes over time. People often need help figuring out whether or not it’s the right time to change their current diet plan, because you must take into consideration a few things in order to nail the transition from Phase 1 to Phase 2. The P90X3 Nutrition Guide was modified to incorporate “intuitive eating.” This is something I’ve worked on with my clients for years because it really works. Intuitive eating is a nutritional philosophy that has you dial in to your body’s natural hunger signals as a means to reaching a healthy weight instead of tracking calories and fats. It results in a much healthier relationship with food than restrictive diets. I wanted to share my thoughts with you on the P90X3 agility exercise. It’s a pretty straightforward exercise—just plyometrics combined with some push ups. No tricks involved. There is also one question I’d like to address today—what kind of shoes one should wear for P90X3? Having good quality shoes for these kinds of exercises is super important. The best advice I can give you is go to a good retail store—like Road Runner or Foot Locker—and let them know what you’re doing. Make sure they know you need shoes that are made to go side-to-side, as opposed to just forward running motion. You also need some good cushion to protect your feet from all the jumping up and down. I love Brookes running shoes, but they were not designed for P90X workouts. One question that I recently got asked was why I did P90X3 when I was already in great shape. I have a simple answer to this question. First of all, this is my job—I am a Beachbody coach. As most of you know, I used to be a lawyer at one of the biggest law firms in the world, but I was very unhappy. Today, I feel blessed to have this amazing career that allows me to pay the bills AND have a lot of fun. Second, I am an athletic person. I do triathlon, I surf, I bike—I love doing sports. It’s just who I am. And, speaking of sports, believe it or not yoga is a part of the P90X workout. I used to do yoga on a regular basis and it really helped me with flexibility. I haven’t been doing it as often as I used to, but I really do like doing yoga. If you don’t think yoga is necessary, you gotta see what Tony says about this—Why Do Yoga? Day 4 of P90X3 includes “The Challenge.” For all of you wondering what The Challenge entails, it basically focuses on chest and back without any additional tricks. It’s a pretty simple and straight-forward, but difficult, exercise. Lots of pull-ups and push-ups are included too, which makes it a classic P90X routine. I want to take a second and mention the workout equipment that I use doing these workouts. The first one that I am a huge fan of is the Power Stands. It’s designed to take all the pressure off of your wrist making it the perfect tool for doing pull-ups. I have been using this since 2004, when P90X first came out, and it’s still a favorite. The Black Band is another tool that wraps around your door hinge. There is also a green band, but I recommend you get the black one, because I think it’s a lot better. Toward the end of The Challenge, you can really feel the burn. The last two minutes includes a combo of pull-ups and push-ups, which is guaranteed to give you some great results in the long run. As most of you know, having a healthy meal plan, and following the rules of the nutrition guide, is crucial to your P90X3 journey. Reading the nutrition guide and picking out the P90X-approved foods that you like will make your journey even more fun. So, jot them down and add them to your grocery shopping list. The P90X3 Warrior workout mainly consists of push ups and a series of core and plyo workouts. One of the best things about it is that it is only 30 minutes long, which pretty much removes any excuses about time. It’s a perfect workout solution for all of you busy people out there. It’s pretty intense and will give you some great results. After I finished it the first time, I burned about 285 calories and my heart rate went up to 165. Just for reference, my average heart rate is around 130. Another great thing about the Warrior workout is that you don’t need any equipment, which means that you can do it wherever you happen to be. So, if you are one of those super busy people who are constantly on the road, the Warrior workout just might be a great workout solution for you. By the way, food is a huge factor. With P90X3 nutrition, Beachbody went back to their original P90X concept—eating healthy food and ditching the junk. It’s that simple. You don’t get caught up in portion sizes—you just have to pay attention to what you eat. Tony points out that one of his role models, Covert Bailey, said that if you eat healthy food most of the time, you’re going to get results like he did. There was a test group comprised of 40 people—a bunch of fitness neophytes, really. Only a couple of them were formerly in shape in their younger years. But, you know how it goes—they got married, had kids, and so on. When the saw how heavy they had gotten, they went in—but, they were scared. One of the main attractions to P90X3 was the shorter workouts, which allowed them to get back to their regular activities much quicker than P90X and P90X2. All, but one of the 40 test group participants lost 10% of their body fat! Incredible, right? The other one wasn’t far behind at 8%. These are amazing results considering they are only working out for 30 minutes a day for 90 days! On average, what is considered a ‘good result’ is a loss of 1% of body fat per month. The results of the test group were a bit more than 3% per month—that’s three times more than average! 1. How long does it take to complete P90X3? P90X3 is a 90 day program, split into three “blocks.” Blocks 1 and 2 each consist of four weeks, while Block 3 lasts five weeks. Additionally, there is an Elite Block calendar, which is an optional block to be completed AFTER the initial 90 days, that lasts four weeks. The Elite Block includes three workouts that are not included in the P90X3 Base Kit. These workouts and the calendar can be found within the P90X3 Deluxe andP90X3 Ultimate Kits or they can be purchased separately. 2. How long are the P90X3 workouts? All of the P90X3 workouts are 30 minutes long with the single exception of the X3 Ab Ripper workout that is included in the P90X3 Deluxe Kit, which lasts 15 minutes. Most workouts also include a 2-3 minute cool down period. 3. What are the P90X3 workouts? 4. Is there a P90X3 app? There used to be a P90X app, but it has been replaced with Beachbody on Demand app and Nutrition+ app. 5. Is there a vegan P90X3 meal plan option? YES, there is a vegan option included in the new P90X3 Nutrition Guide. 6. What is included in the P90X3 kits and what is the P90X3 price? 90 Day workout calendar—we suggest you laminate this since it’s so important; it’ll let you know what to expect and how to prepare yourself for the upcoming workouts and is an awesome way to stay on track. For current pricing, check our P90X Workouts page. If I didn’t answer YOUR question in this P90X vs P90X3 post, you can contact me here. An important tip—take your Before & After pictures! The main reason we want you to do this is because people doing the P90X workouts tend to burn fat and gain muscle at the same rate, so the scale isn’t necessarily a reliable tool to gauge your progress. In fact, your weight may not change at all—however, the changes will be visible in the pictures. And, there is another reason for them—they may just win you $300 in our Healthy Bod Challenge weight loss transformation contest. ← Thanks for Checking out my 21 Day Fix Meal Plan!